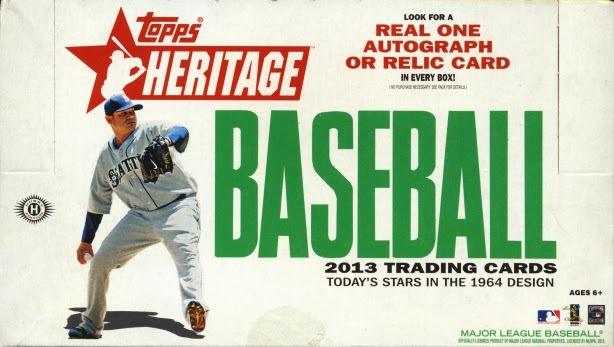 Set builders rejoice, 2013 Topps Heritage Baseball is here. This year’s release is based on the cards of 1964 Topps Baseball. Topps has changed some things up again this year which is starting to over complicate what used to be a simple set. 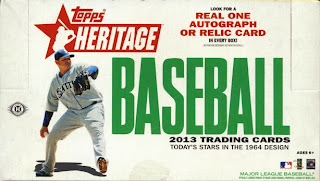 What was fun for the 2011 Heritage set based on the error cards that actually existed in the 1962 Topps Baseball cards that was then expanded with the 2012 Heritage set that made some sense based on the 1963 Topps Baseball cards set now seems a bit like overkill for 2013 Heritage. But that won't matter to most seasoned collectors as they will be busting boxes of Heritage for the set building regardless. My hope is Topps scales this back and holds a bit truer to the 1965 Topps Baseball set for next year's Heritage.